Rosacea is quite a common skin condition that most often develops in teenage years. It can be extremely light and just blend in with natural skin pigmentation, but in some cases it can flare up quite significantly leaving a very visible red pigmentation and inflammation. Unfortunately, once you have experienced this condition it is likely to reoccur and can become worse with age. Science has not been able to identify what the exact cause is and to this day there is no cure to deal with it. In very severe circumstances the help of a dermatologist is the best solution. Medicated prescription drugs are available that are very fast acting. When combined with laser treatment results can be achieved almost immediately. But such treatment options are not suitable nor necessary for less severe outbreaks. For these there are products available that will deal with the problem by reducing the inflammation and removing the red pigmentation that is so unsightly. To help you avoid products with just clever marketing, we have put together this list of treatment options. They are proven to be effective and if you start using them immediately you will notice improvements in a matter of days. This type of rosacea is more prevalent than the rest. It is characterized by permanent redness – commonly called “facial flushing.” It is capable of producing intense burning, itching, and stinging sensations on your skin. People with sensitive skin become its frequent victims. It is characterized by a thick, bumpy, or uneven skin texture. 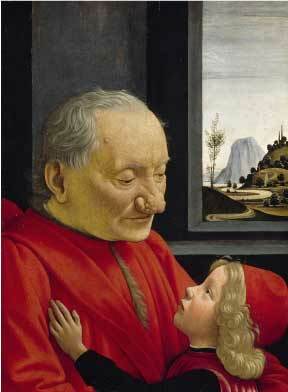 People limited it to just nose enlargement, which isn’t true. It can also affect other areas of skin including chin, cheeks, eye-lids, forehead, and ears can also be affected. Red, watery, irritated, stingy, light-sensitive, and burned eyes are the signs of ocular rosacea. Besides making your eyes prone to infections, it can also produce blurry vision and a loss in your eye-sight. Just as the name describes, this type comes with an addition of papules and pustules to the persistent redness caused by rosacea. You cannot solve a problem without knowing its cause. But things aren’t simple when we talk about rosacea. We’re yet to discover the exact cause behind it. However, some environmental, physical, dietary, and medical conditions are known to trigger rosacea. Trending: 7 Best Apps For Acne & Skin Care You Should Download Now! 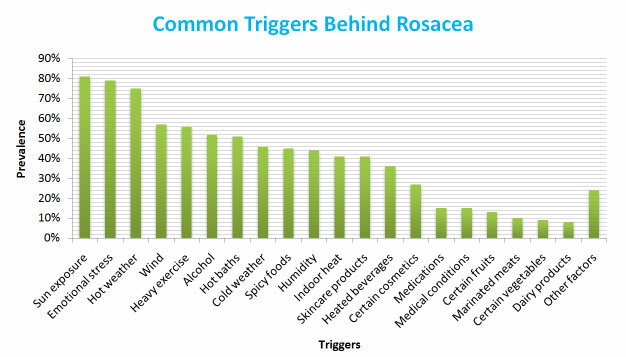 A rough analysis of the causes and triggers behind rosacea. Now that you’ve got familiar with rosacea and its causes, let’s jump over to discussing different effective ways of keeping it at bay. Think of laser treatments as a Swiss Army knife. Not only are they used in treating adverse diseases like cancer and macular disorders, but their usage for treating skin diseases has also yielded promising results for the past several decades. Intense pulse light (IPL) is a newer form of laser treatment which can be effectively used for skin rejuvenation and treating rosacea. 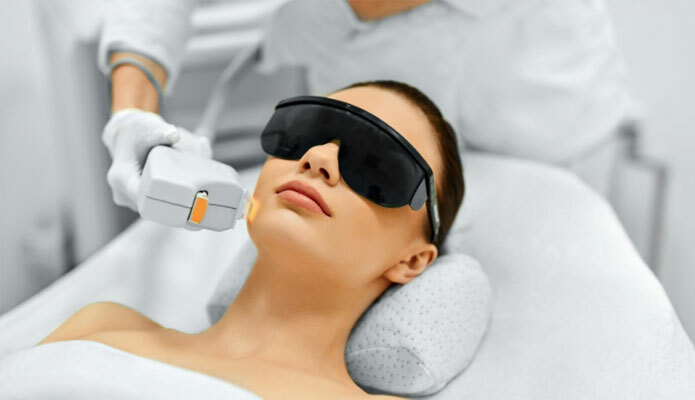 Unlike traditional dermatological lasers that emit a single wavelength, IPL emits a large spectrum of light that makes it more effective than the rest. Its efficacy is not hypothetical, recent studies have proven it to be a worthy option for treating rosacea. PDT is another treatment that makes use of specialized light particles to destroy the dead and infected skin cells. First, a photosensitizing agent (usually in the form of a drug) is applied to your skin. Secondly, your affected areas are exposed to the light, which activates the drug to do its job. It is mainly used for treating skin cancer patients. However, it is also proven to be an effective treatment for mild to moderate acne conditions, including rosacea. Photodynamic therapy can particularly effective for populopustular rosacea. Researches have proven it to be effective in destroying P.acnes bacterium, and reducing pore size and sebum production. There’s an endless stream of over-the-counter products out there that promise to eradicate your rosacea, but not all of them are worth trying out. Saving your time and money, I’ve gathered some of the most effective over the counters products for treating rosacea. The primary ingredient in afrin is oxymetazoline, a topical decongestant also used to treat nose and eye-redness because of its vasoconstricting (blood vessel narrowing) property. It is easily available over-the-counter in the form of eye-drops and nasal sprays. Although, FDA hasn’t been clear about the usage of oxymetazone related products for rosacea, it is an effective rosacea treatment in the eyes of Rosacea International Expert Group. Two is indeed a pretty tiny number to draw any conclusions upon, but there really isn’t any harm in occasionally using it for instant results on weekends or other special gatherings. Finding a good quality nasal spray or eye-drop containing 0.1% Oxymetazoline. Soaking cotton bud or a tissue in it. And then applying to your affected areas. Aspirin is a commonly prescribed OTC treatment for rosacea. Primarily, it is used to alleviate headache, fever, and in the treatment of adverse diseases like cancer. But its effective anti-inflammatory property is what makes it a perfect choice for rosacea sufferers. By the way, Dr. Bikowski didn’t say it through revelation; he did an informal study on his own rosacea patients, which led him to produce this statement. Consider visiting your Derm before taking its doses. Being derived from Vitamin-A, an essential vitamin that help rejuvenate our skin, tretinoin can be very effective in repairing skin damage done by the sunlight or diseases like acne and rosacea. 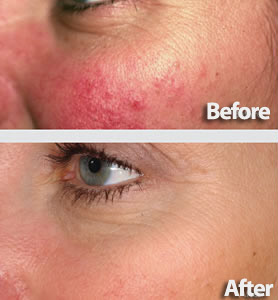 Dr. Cynthia Bailey has been successfully using Ratin-A for treating her rosacea patients as a primary ant-aging agent. According to her, rosacea patients more easily tolerate tretinoin than low pH products such as Vitamin-C and Alpha-Hydroxyl-Acids (AHAs). You should note that tretinoin (Retin-A) may not be available over-the-counter, and you must consult with your Derm about its prescription. I can’t emphasize enough about the fact that every patient’s skin is unique and there’s hardly ever a “one size fits for all” sort of treatment for it. An experienced dermatologist is who can effectively understand what your specific needs are and prescribe a treatment that suits your skin. Accutane, either for treating acne or rosacea, should only be used as a last resort. If you’re sure that you’ve tried everything else that you possibly could, then you can opt to using it. It is a synthetic form of vitamin-A – a vital component for most OTC products because of its skin friendly nature – and it’s usually prescribed to be taken once or twice a day for several months. But for rosacea patients, however, a lower dosage is mostly preferred. Accutane can be effective for treating pimples and bumps caused by rosacea as it’s found to be very effective in reducing pore clogging by reducing the size and number of oil glands present below our skin surface. 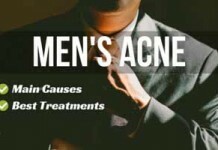 It also fights acne causing bacteria (P.acnes) and reduces inflammation. As a result, a less oily and smoother skin is usually obtained. However, the end results might not always be the same. 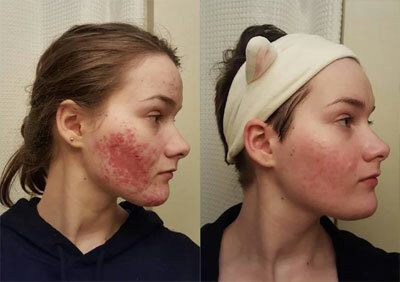 Maybe it’s not the first time you’re hearing about the consequences of Accutane, but let me remind you one more time… Aside from being able to cause highly intimidating problems like itching, dryness, irritation, nose bleeds, and even muscle and joint pain, Accutane (or Isotretinoin) can be drastic for women going through pregnancy or want to get pregnant. Women bearing a baby are strictly advised not to use it because of adverse side-effects to baby including: serious physical and mental defects, high risk of preterm labor – or even worse – the death of baby soon after birth. To minimize the side-effects of Accutane, supervision of an expert is inevitable. And women should stay in touch with iPledge, which is a program dedicated to educate women about the side-effects of Accutane when they are pregnant. It is, by far, the most successful and popular product on store for treating rosacea. It makes use of sulfur, a recognized homeopathic ingredient proven to effectively heal skin diseases like acne and rosacea. It has a moisture rich formula that soothes your skin. And a non-oily homeopathic formula ensure that your pores don’t clog. 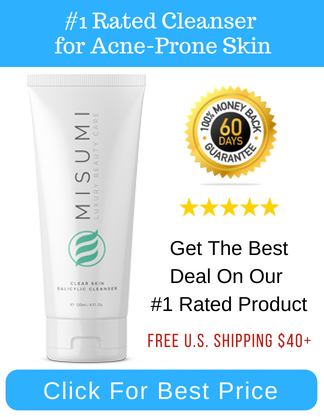 It’s common among its users that it can cause dryness after the application, if it does so, you can apply a good quality moisturizer to prevent the damage. My fair warning: It’s not untrue that even the most successful products do not work out for everyone. When going for prosacea, the most important thing you should take in your account is that whether you’re allergic to sulfur (active ingredient in prosacea) or not. If you are, then it might work terribly wrong on your skin. If for any reason after its application you observe excessive redness, itching, swelling, or burning, stop applying it immediately to keep the damage at minimum. Metronidazole gel or just “Metro Gel” has been a popular prescription for rosacea for more than a decade. It’s latest formula is called METROGEL® 1%, which uses metronidazole as an active ingredient can be used only once in a day to effectively heal bumps and blemishes caused by rosacea. Though prosacea cannot control severe rosacea, it specializes in controlling facial flushing and mild acneiform breakouts caused by rosacea. It also decreases oil production, which can help preventing pore clogging. It should be used twice a day but make sure to keep it off the T-area of your face. Do not expose yourself to sunlight as your skin might become more sensitive upon its usage. However, just like ANY other treatment, if it doesn’t respond well to your skin stop using it right away. Consulting with your Derm won’t ever hurt. From successful laser treatments like PDT and IPL, to the best over the counter pills and products, we haven’t left anything that could help you learn how to get rid of rosacea safely and effectively. As long as its prevention is concerned, you should concentrate on the list of common triggers I’ve provided earlier in this post and see whether or not any of those factors are actually triggering your rosacea. If suspect any of those factors are triggering your condition, try keeping them at bare minimum if not avoiding them entirely.